The District's dockless electric scooter services, currently locked in a five-way battle for micromobility supremacy, say they'll continue service throughout winter months as long as conditions aren't hazardous – or at least as long as people keep riding them. WASHINGTON, D.C. -- The District’s dockless electric scooter services, currently locked in a five-way battle for micromobility supremacy, say they’ll continue service throughout winter months as long as conditions aren’t hazardous – or at least as long as people keep riding them. As of Friday, Ford Motor Company-owned Spin became the latest electric scooter provider in the city. The company deployed 100 units initially, and says it plans to increase its D.C. fleet size by 50 scooters per week. It hopes to hit the District’s cap of 400 units by the end of December. 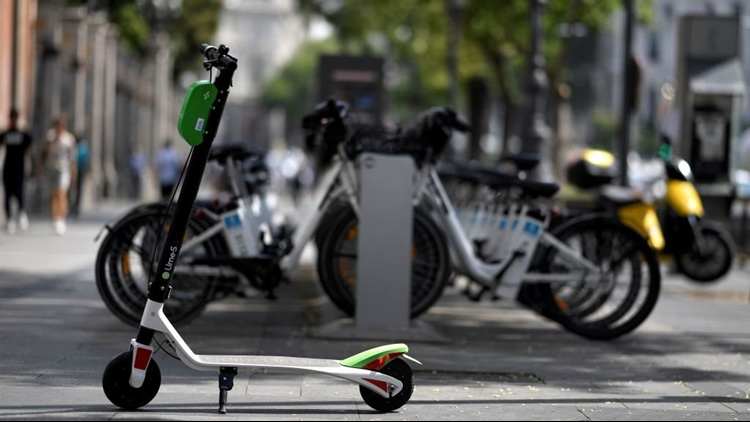 READ MORE | Ford buys electric scooter startup Spin, joining competitors Bird and Lime | VERIFY: Can you ride an electric scooter on D.C. sidewalks? Scooter safety on minds of riders after man on scooter struck, killed in D.C.
A day earlier, the metro saw its first snowfall of the season, with parts of the region seeing anywhere from 1” – 3” inches of snow. The WUSA9 weather team reports it was the earliest measurable snowfall at the Reagan National Airport observation site in 22 years. What does that mean for the city’s approximately 1,700 dockless electric scooters and their riders? For the most part, they say they plan to keep the scooters running as long as the ridership is there. And according to Lime general manager Sean Arroyo, despite dropping temperatures, usage has remained high. "Bird is extremely committed to the safety of our riders, and so we take into account the weather conditions of each city where Bird is available. We have a team dedicated to closely monitoring all conditions, and they adjust our operations accordingly. This includes pausing our service when weather does not permit safe riding, and can sometimes lead to removing Birds from the road during periods of inclement weather caused by storms or hurricanes." In a follow-up email, a Bird spokeswoman said the company makes case-by-case determinations on when to recall the entire fleet in case of extreme temperatures or snowfall levels.